Our guest speaker for our August 2010 lecture was Prof Nial Tanvir from Leicester University who came to talk to us about "Gamma Ray Bursts as probes of the distant Universe". His research group leads the field in the UK and they are heavily involved in the SWIFT mission which is a NASA spacecraft dedicated to the study of gamma ray bursts. The term gamma ray burst is quite descriptive as they are the most powerful source of energy that is known in the Universe. They are at such a high frequency (i.e. short wavelength) that they are at one end of the electromagnetic spectrum, way beyond blue visible light. A typical burst last a few seconds but they can vary from thousandths of a second to several minutes. The initial burst is normally followed by an afterglow in the same spot in the sky which registers at longer wavelengths such as X-rays, UV, optical, infrared and radio waves. 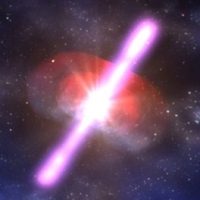 The first gamma ray burst or GRB was not actually recognised as such. It was record in the 1960s by US Vela satellites which were designed to watch out for nuclear tests in space. These discoveries were only declassified and then published in 1973 which led to much speculation as to what these extreme events were caused by. It was only in 1991 with the launch of the Compton Gamma Ray Observatory with a dedicated gamma ray detector that it was realised that GRBs were randomly distributed in space and so they could not have a galactic origin. The next breakthrough in understanding these phenomena came thanks to another satellite called BeppoSAX which detected not only the initial burst but an X-ray source in exactly the same position. Prompt follow- up work using the William Herschel Telescope in the Canary Islands showed emissions in the visible part of the electromagnetic spectrum. It was discovered that the burst had emanated from a faint and distant galaxy. Astronomers struggled to find out how far away this galaxy was and meantime another GRB erupted allowing to place this next event at the incredible distance of 6 billion light years away. The latest spacecraft to study GRBs is NASA´s SWIFT which was launched back in 2004 and is still working. It has the advantage of being equipped with not only a gamma ray detector but also X-ray and optical telescopes so it does not need to rely on ground-based telescopes to follow up observations. On average SWIFT detects about two GRBs a week. It has been found that GRBs are split into two distinct types: long duration of greater than 2 seconds and short duration of less than 2 seconds. The long duration bursts are more common and so have been studied in much greater detail. They are thought to occur when a massive star comes to the end of its life and explodes as a supernova. The short duration bursts are thought to originate in the merger of two massive objects such as neutron stars. It is fortunate for life on Earth that GRBs are so far away, relatively rare events, and are unlikely to occur in an evolved galaxy such as the Milky Way, For, in theory, a burst at `only´ 3,000 light years away could destroy up to half of our ozone layer that shelters us from the Sun´s harmful UV rays.